July 02, 2018: RBI had earlier published the "Master Circular on Conduct of Government Business by Agency Banks - Payment of Agency Commission", by Master Circular RBI/2017-18/2 dated July 1, 2017. It has now been revised and updated which consolidates important instructions on the subject issued by the Reserve Bank of India till June 30, 2018.
a. At the full rate, in cases where the transactions are handled by the bank at all stages, i.e., up to the stage of dispatch of scrolls and challans / cheques to the Pay and Accounts Offices, and treasuries/sub-treasuries. b. At 75% of the applicable rate, where the dealing branch is required to account for the transaction by passing on the scrolls and documents to the local/nearest branch of Reserve Bank of India or any agency bank conducting government business. c. At 25% of the applicable rate, in the case of agency branch which received the scrolls and documents from dealing branches of other banks and is responsible for the accounting of these transactions and dispatching of the scrolls and documents to the Pay and Accounts Offices, Treasuries, etc. 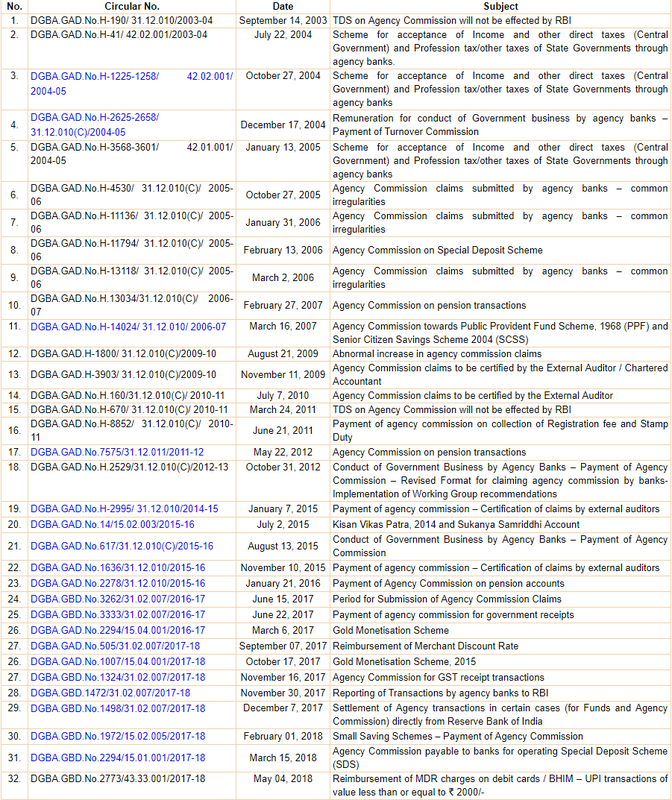 b. the agency commission claims made in respect of volume (number) based transactions viz. ‘receipt’ and ‘pension payment transactions’ have been claimed only once and the same stands excluded while arriving at value based transactions in respect of ‘payments other than pension payments’.